I'm back for ANOTHER review post for the week! I felt compelled to share this with you because it's been the most impressive lip color and formula that I've used in a while. Which says a lot because I have A TON of lipsticks/glosses with me at all times. It's really quite silly to carry so many but I love options! On a whim last weekend, while strolling the aisles of Walmart, I picked this color up along with two other brands/colors. So far this is the only one of the 3 new additions I've tried. Who knows....maybe the other two will be worth reviewing too. 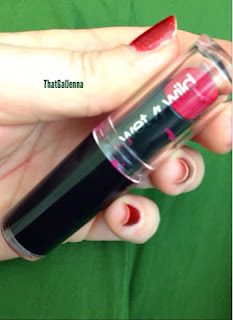 If you're like me, you may be thinking, Wet n' Wild? Really? I'm going to share photos of the lipstick throughout my average day. I'm not normally a fan of this "flat top" but it wasn't enough to deter me and I ended up being totally fine with it. 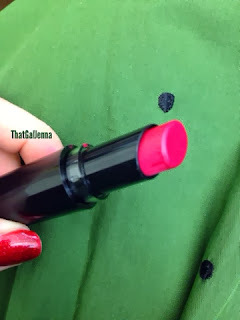 Because it's a little difficult to take the cap off you end up getting some residual lipstick on the inside. This is my only issue. After a couple of hours and drinking from a soda can. 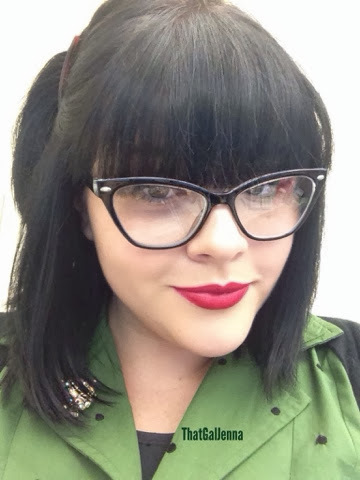 As you can see there wasn't ANY issue with feathering or "pilling" of the lipstick which is my biggest issue. This is the lipstick with a clear gloss on the top of it. 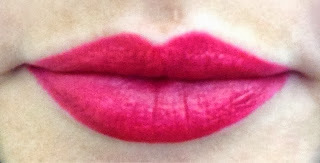 I prefer the lipstick without the gloss addition but it all depends on how you like the matte look. Also, I was able to rub my lips together throughout the day without them feeling incredibly dry and without any gathering of the lipstick. 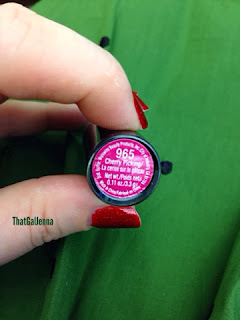 This will for sure be my "go to" lipstick until I find something that has this longevity! Dude! 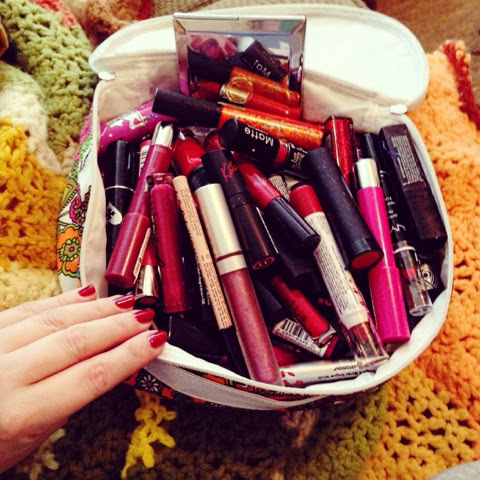 You have an insane amount of lipsticks! :O And my using of the word "dude" should show you how amazed I am because I never ever use it, haha! 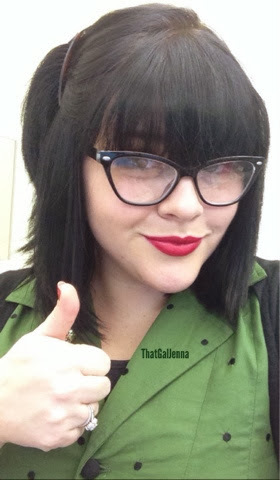 :p I love lipstick, but what usually happens is that I feel too shy to wear striking colors. I only occasionally put on some fuchsia on my lips, only because I won it in a giveaway (I'd have never dared buy it, hehe). 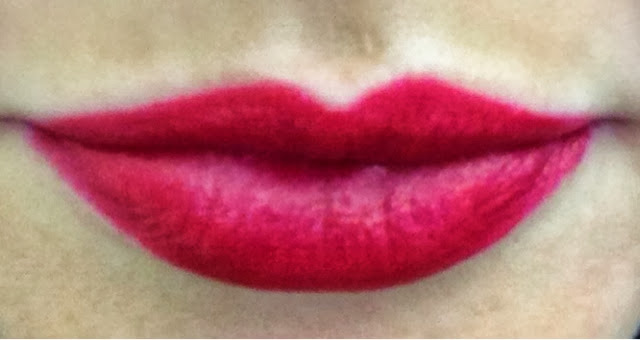 It's funny how a little color on your lips it can lift you up and make you feel different. I should be more daring and try different colors :p.